Our trip to Trinidad was the best trip I have ever been on. I have enjoyed every other mission trip, in the country and out, but there was something special that God had for us that I don’t think any of us were ready for! On the July 5th, 8 students and 6 adults arrived in the middle of the night to start an adventure together. We arrived at the airport early eager to get started, some nervous about their first time flying. We made it to Trinidad and through customs around 10pm. When we exited the airport there were numerous people ready to greet us from the churches and district. It was a great welcoming. We then took off in two vans to where we would spend the next nine nights in the town of Arima. Our driver for the week. Saturday morning came and we were all a little groggy but ready for what God had in store. 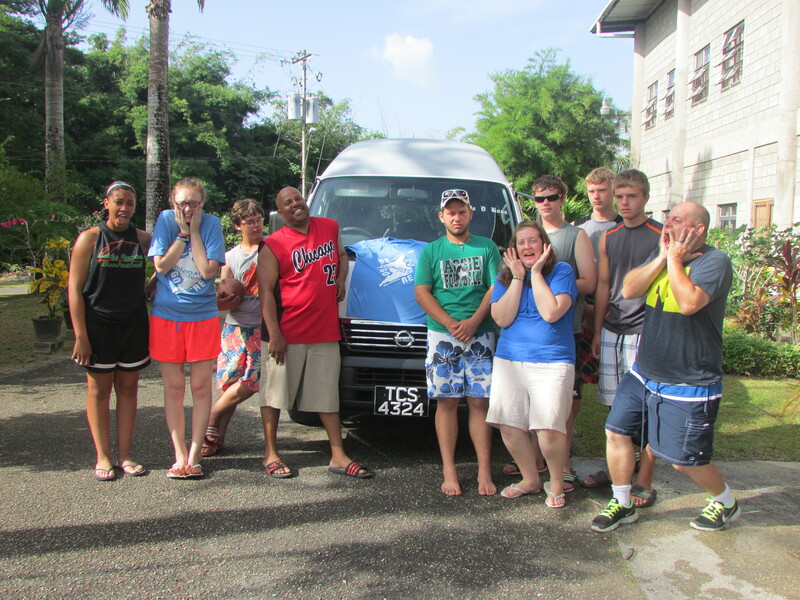 We loaded up and headed out to Sangre Grande to the Nazarene Holiness Centre (NHC) for VBS! Tim and I recreated our Zacchaeus skit with great joy 😉 (It probably looked a little more like Quasimodo but oh well) The first day we had over 40 children. Later in the day Pastor Sampson took us around Port of Spain and to see many different sites including going up onto an overlook of the city. It was beautiful! While on this journey Pastor told us about the crime and drug problems in the heart of the city as well as about the corruption of the government/police. He also talked about the diversity/unity of the people which we witnessed all week. Even though we felt we stood out because of light skin color, we were accepted and most people in the community didn’t even give us a second glance. Sunday we went to church at the NHC. We loved it!!! There was passion and energy in worshiping Jesus. Matt as well as some instrumentalists from the NHC church lead worship. Then came time for Jr. church. I don’t think the church had ever had this amount of kids on a Sunday morning. There was at least the 40 that were there the day before if not more. They outnumbered all of the adults and teens! Our team did the story of Jonah…can I say we have some great actors 😉 While that was going on I had the privilege to bring the message to the teens and adults. We closed with Communion and some more spirited worship. What a great morning! 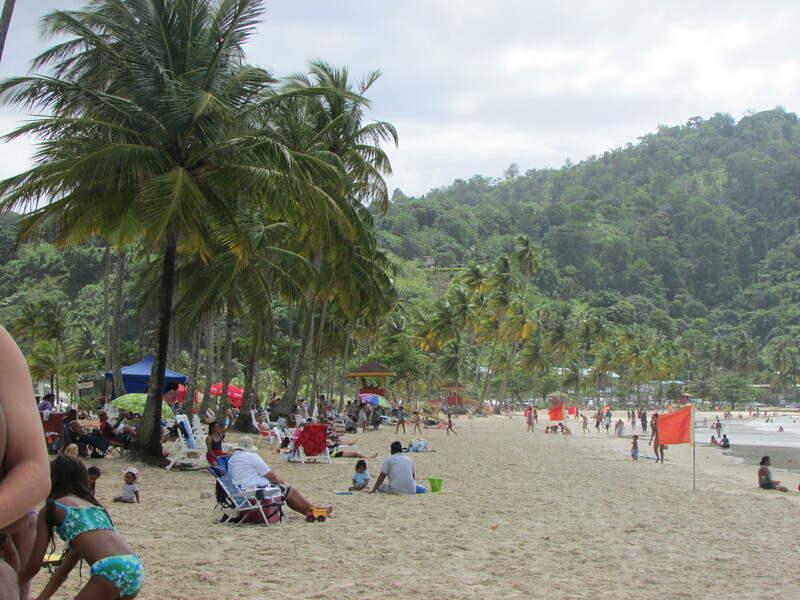 In the evening we went to Williams Bay to get the water 🙂 We prayed together along the beach and our worship was competition for the loud music that surrounded us (loud music is everywhere in Trinidad)! Monday we were back at the NHC for another day of VBS (David & Goliath). This was also one of the days that we were joining the Trinidad & Tobago District by fasting our lunch. It was another great day with 93 kids. After VBS we went around the community by the church to do some door to door evangelism. We had the opportunity to pray with and tell many about the love of Jesus! That evening we went to a really nice mall that had some stores to buy some souvenirs and a little DQ. By Tuesday we had over 100 kids at the VBS! It was awesome! God was doing some great things. Micah had the opportunity to share who Jesus is and what He did for them on the cross. Numerous kids raised their hands to accept Jesus! Praise God! That evening we walked around the town of Arima. We had an interesting run in with a local, had some ice cream, and even got to hear someone play steel drums. Wednesday we started VBS at another church, LaPlatta. When we arrived we noticed little kids helping set up the church area. It was awesome to see but also a sad reminder that there is a generation missing. We once again did the Zaccheaus skit, even better the second time around 😉 There were around 40 kids. That afternoon we took naps and played some games. Later we played basketball with Shawn & Christian from NHC and some neighbor kids. Thursday was our second day at LaPlatta as well as our second day to pray and fast lunch. It was a great day. There were over 70 kids! We walked around the community and once again prayed and shared the love of Jesus to many different people! It was so exciting to see our teens stepping out of their comfort zone, sharing their faith and praying with people they didn’t know. That night we went to Pastor Sampson’s house for a delicious meal prepared by Sis Mary! We ate and talked with the DS of the district, Rev Victor George and his wife Marilyn. It was a fun evening of fellowship, relaxation and Trinidad fare! Friday was our last day with the kiddos from both churches. In the morning we closed off VBS at LaPlatta with numerous kids accepting Jesus as their Lord and Savior! It was a huge encouragement to all to hear and see. One boy even ran out of the tent where they prayed saying, “I am a Christian!” That evening we closed off the VBS at the NHC. With all of the parents and kids including us, there was at least 150 people there. It was a good night! It was sad to leave the kids but we were happy that we had an opportunity to make an impact on them for Jesus! 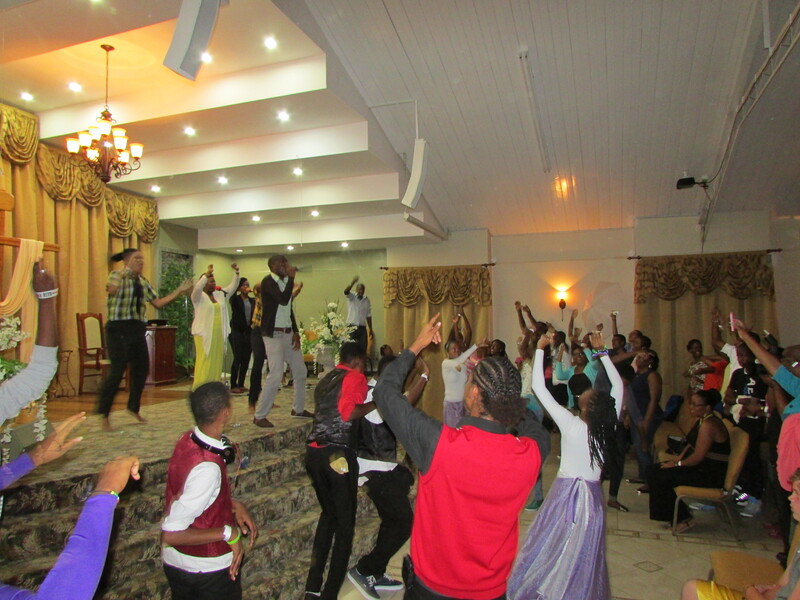 That evening we went to Arima Nazarene Church for a concert that raised money for the district teen camp. It was sooooo much fun! We were jumping up, dancing and having a great time. This concert showed us the creativity and passion of the young people. They truly worship the Lord with their whole being! I know we will all remember this for the rest of our lives! On Sunday we packed up the vans had a couple more prayer and singing times and said “See you later” to the friends we made on our trip. It was hard to leave but we knew it was time to head home. To Pastor & Sis Sampson, Pastor & Sis Best and all of the people at the Nazarene Holiness Centre and LaPlatta churches we love you and are so thankful for the opportunity to come along side of you in ministry! You have taught us so much, especially how to truly love and serve in the name of Jesus! You all went above and beyond the call of duty. You were Jesus to us. May God bless you for your hospitality and service for Jesus! Continue to be the hands and feet. We look forward to the day when we once again can come down to Trinidad & Tobago and worship and serve with you! Come in August to Adrian First Nazarene to hear more about this trip! It was truly a blessing to experience for the entire team at NHC. There are definitely some changed lives and mindsets, especially at a time that the district is refocusing. Thank you Pastor Mike to you and your team, for the opportunity to serve. Thank you NHC for your labour of love.